Warm up your chilly autumn nights with this robust chili. This hearty recipe calls for plenty of meat, peppers, spices, and your favorite porter or stout. If you don’t like pork, simply double up on the beef. If you like beans in your chili, don’t hesitate to add a can or two. Add the ground beef, ground pork, olive oil, and half of the diced onions and peppers to a large saucepan. Cook on medium-high. Stir frequently, until the meat has cooked all the way through. Drain the excess fat from the pan and discard. Mix the chili powders, paprika, oregano, and salt together in a small bowl. Add to the meat and veggie mixture. Add minced garlic. Sautee on medium heat for about 5 minutes while stirring frequently. Be sure to scrape the bottom of the pan, so the seasoning doesn’t burn. Add the crushed tomatoes, diced tomatoes, diced chilies, and the remaining pepper and onion mixture. Stir well. Lower heat to medium-low and simmer for about 20 minutes, or until all the peppers and onions are soft. Stir every few minutes. Remove from heat, add 12 ounces of stout to the pan and stir well. 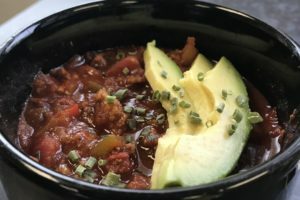 Serve in bowls and garnish with your favorite chili toppings. 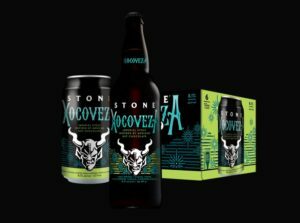 Stone Xocoveza was used in the development of this chili recipe. It’s an imperial stout inspired by Mexican hot chocolate and made with chocolate, cinnamon, coffee, nutmeg, and pasilla peppers, which gives the chili a nice, robust flavor. However, most porters and stouts with coffee and/or chocolate notes would work wonderfully in this recipe, as will many pumpkin beers.